Robert Holden Shift Happens! : How to Live an Inspired Life. Starting from Now! Shift Happens! : How to Live an Inspired Life. Starting from Now! 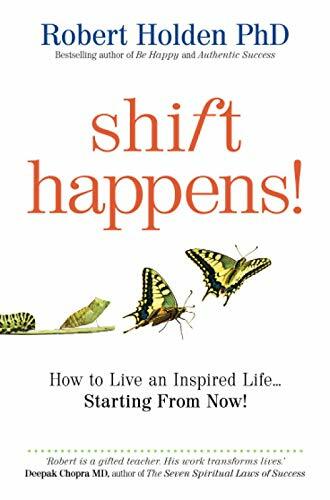 "Shift Happens!" is about 'more' - more happiness, more success, more love, more peace, more prosperity and more joy. Packed full of wisdom, "Shift Happens! ", tackles the fundamental everyday concerns that can undermine true joy and fulfilment. Written in a short essay style, Dr Robert Holden offers you a powerful mix of inspiring principles and proven methods that help to unblock yourself, release fears, drop the struggle, transform relationships and embrace a new level of creativity and joy. Dr Robert Holden draws on his inspirational practice teaching the psychology of success and happiness and reveals real life stories of people radically changing their lives for the better. With an easy wit and clear style, Dr Holden offers reflections from the full spectrum of human experience to help you manifest change in every aspect of your life. Discover: how to choose happiness and allow yourself to relax; the route to forgiveness and releasing yourself from past traumas; harness stress to take you to new heights of success; how to develop trust and let go of your fear; and, kickstart change in your life today! Robert Holden PhD is the Director of The Happiness Project and Success Intelligence. His innovative work on happiness and success has been featured on Oprah and in two major BBC-TV documentaries, The Happiness Formula and How to Be Happy, shown in 16 countries to more than 30 millions televisions viewers. He is the author of the bestselling books Happiness NOW! , Success Intelligence and Be Happy. He lives in London with his wife and daughter. 5. Shift Happens! : How to Live an Inspired Life. Starting from Now!